Our Clearly Amish San Marino Bed Chest is constructed with an English Dovetail Cedar Drawers and Mortised and Tenon joinery to last a lifetime, a perfect addition to any bedroom. 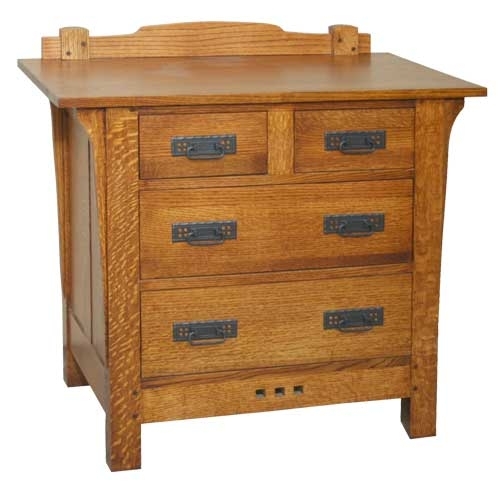 As beautiful as it is built, this Large Bed Side Chest features Two small Drawers and Two Large Drawers and serves as a night stand and as a small Bureau for storage. Notice the three dark end grain inlays on the bottom apron board. Attention to detail and a large amount of storage. Our San Marino Collection of Bedroom Furniture was inspired by the California Arts & Crafts movement centered in the Pasadena San Gabriel valley area. Notice the unique curved Backplashes, Hammered Iron Hardware and Dark Oak end grain accents on the bottom panel. Proudly Made in the USA.